This casual beach resort surrounded by reefs and a lagoon is set on a compact island that is accessible by seaplane. 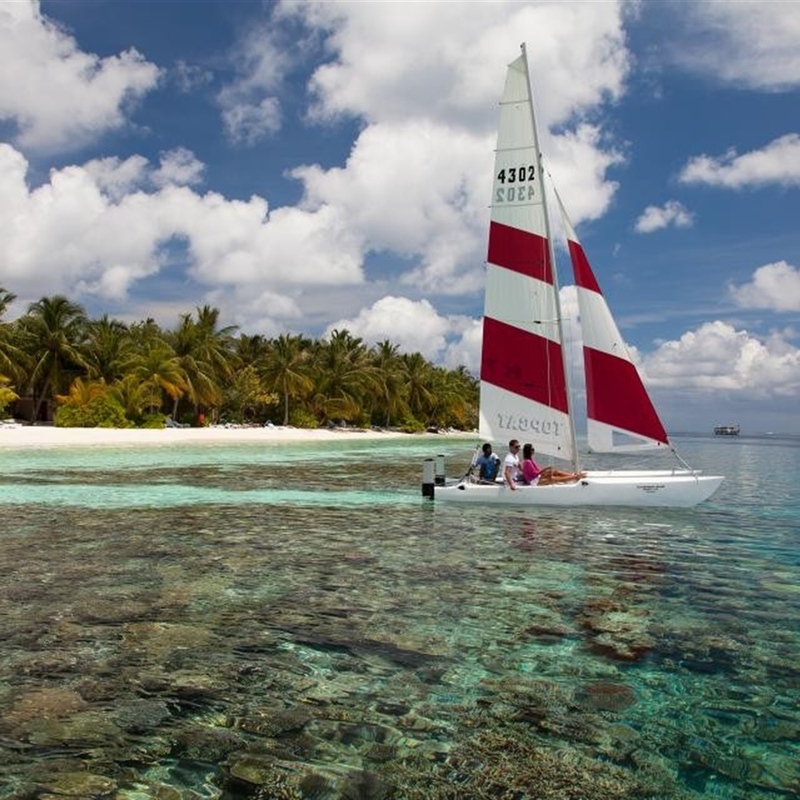 Vilamendhoo is situated in South Ari Atoll, a scenic 25 minute seaplane from Ibrahim Nasir International Airport. 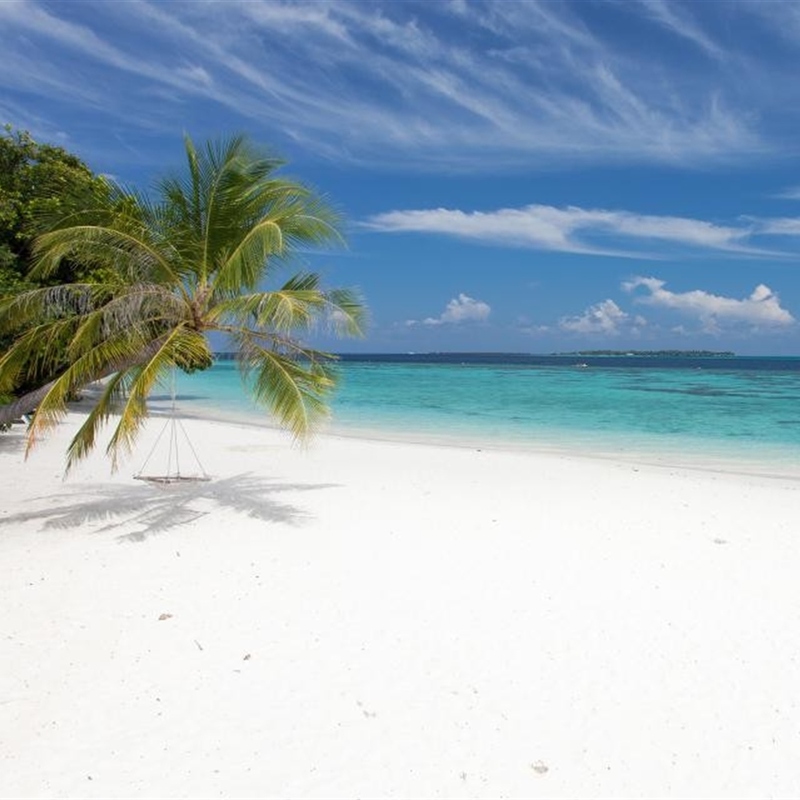 This pristine Island is surrounded by a beautiful lagoon and one of the most spectacular house reefs in the Maldives. 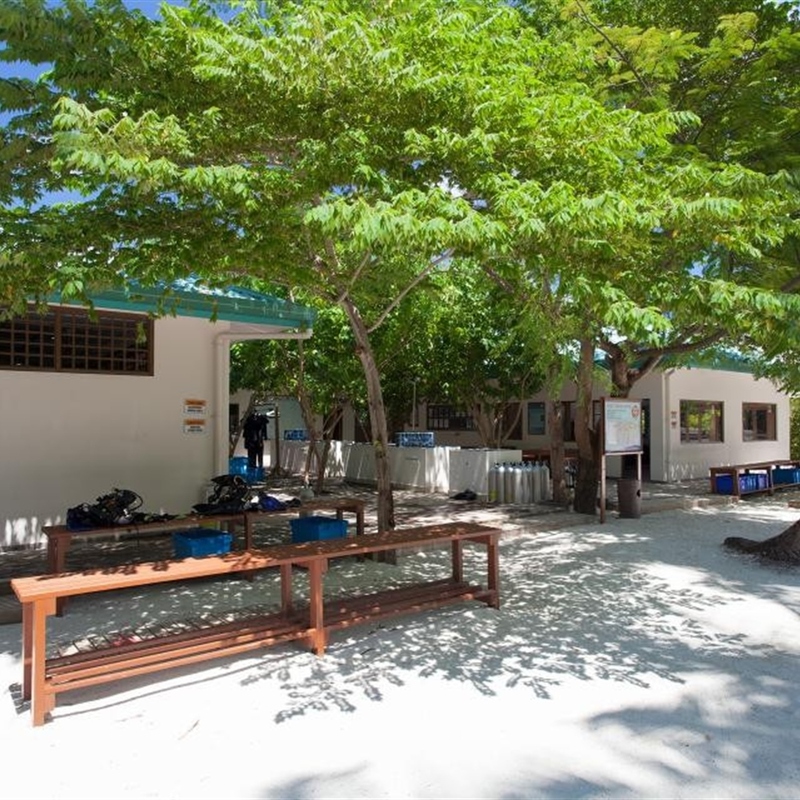 To explore the reef, the resort features a PADI dive centre offering a range of courses for both first time and experienced divers. The resort also boasts two fresh water swimming pools, one overlooking the beach which is exclusively for adults, and the other in the tropical centre of the island with a separate pool for children to enjoy. There are plenty of bars and restaurants to choose from and for guests selecting the All Inclusive option. Drinks are included 24 hours a day and the Bonthi Bar is open as long as you are there. The resort also features the well renowned Duniye Spa where overwater treatment rooms provide an idyllic spa retreat. Full board & all inclusive available. The main buffet restaurant is divided into 2 separate dining areas, in traditional open air style with sand floor and thatched roof. The restaurant offers a variety of international and regional cuisines, Friday night is Maldivian night with a themed menu and waiters in traditional dress.­ Sunday breakfast welcomes you with complimentary Sparkling Wine. The dress code can be very casual. Many guests are barefoot. Women may wear bathing suits with a cover-up for breakfast and lunch. Men are required to wear shirts with sleeves at all times in the Restaurants.­ In addition to the main restaurant, 2 a la carte restaurants are also available to book and pay for locally. The Asian Wok Restaurant specialises in Asian cuisine and Teppanyaki, The Hot Rock Restaurant offers seafood, steak, chicken or exotic game cooked at your table on "hot rocks" A Snack Menu is served at Bonthi Bar and Sunset Bar. 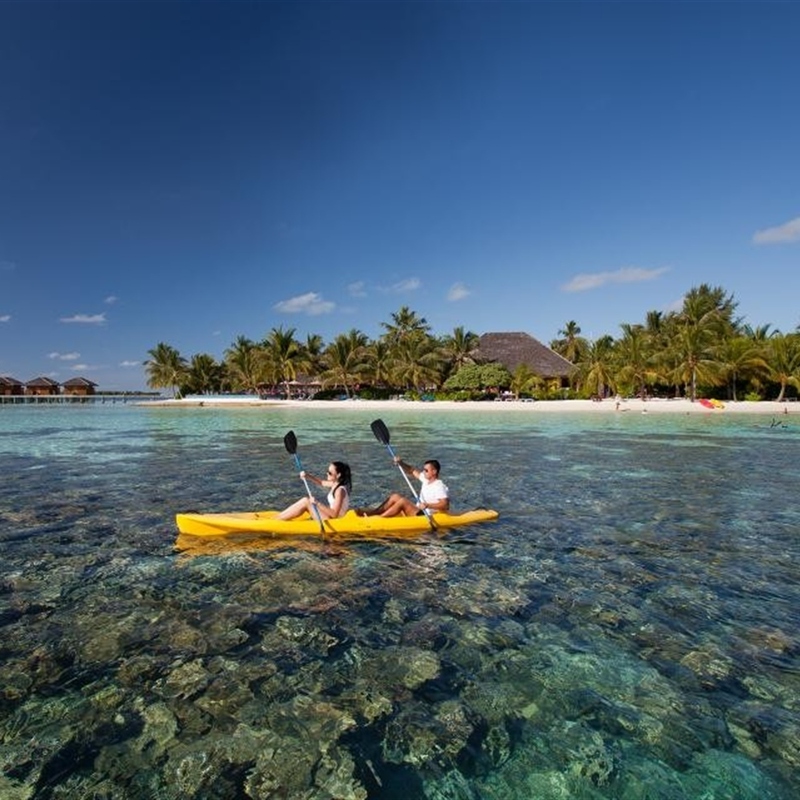 Optional Activities include various water sports and spa treatments. Full board & all inclusive meal plans are available. The Asian Wok Restaurant specialises in Asian cuisine and Teppanyaki, The Hot Rock Restaurant offers seafood, steak, chicken or exotic game cooked at your table on "hot rocks"
Flights are available throughout the year departing from the UK and arranged with Oonasdivers. Transfers are included within your package. Please call or e-mail us for your tailor-made quote. In order to connect with seaplane transfers, your international flight needs to arrive in Male before 17.00 and for the return your flight needs to depart Male after 09:00. Carry-on baggage allowance on the seaplane is 5kg and checked in baggage is 20k. Excess charges are US$4.00 per kg and applicable on both outward and return journeys. Please note, infants do not receive any baggage allowance. 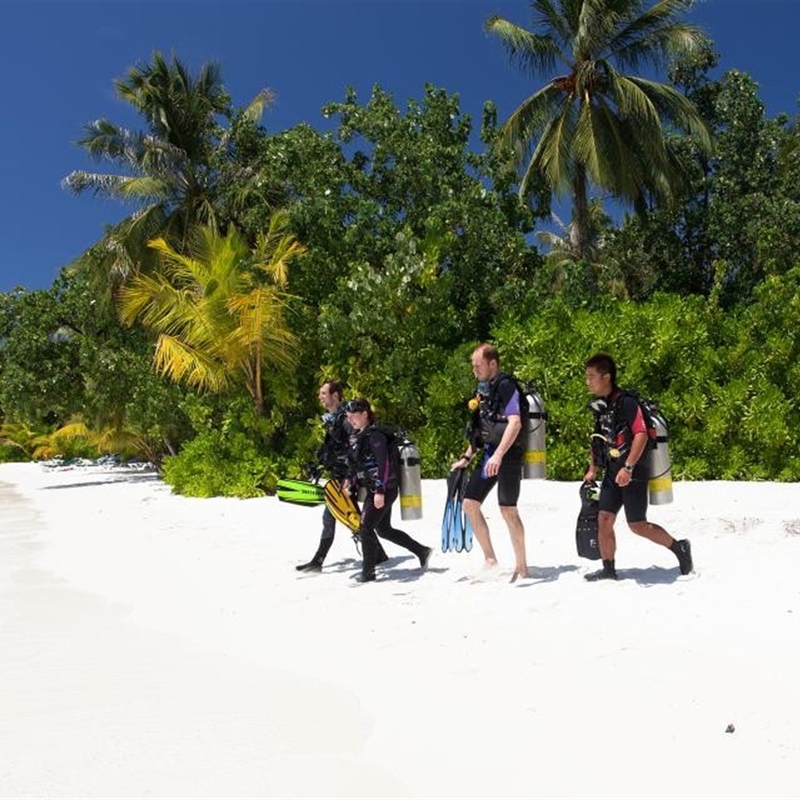 As with most of the Maldivian islands the diving is organised as either a non limit 6 consecutive day house reef package, or a 10 house reef dive package, boat dives are booked and paid for locally for a supplement. Vilamendhoo is the perfect diver’s paradise for beginners and experienced divers. 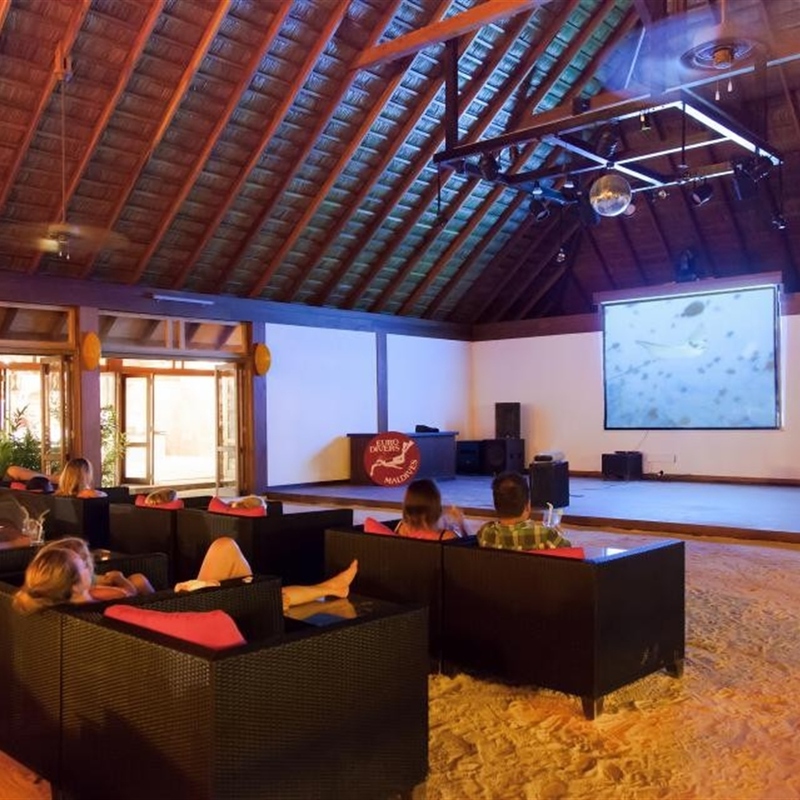 Your stay at Vilamendhoo can easily be combined with one of our Maldives liveaboards.